I love having shiny happy things to take with me on trips, especially when they make my life easier. I'll admit that I probably didn't need my Kate Spade toiletry bags, but they make packing up so much more pleasant! 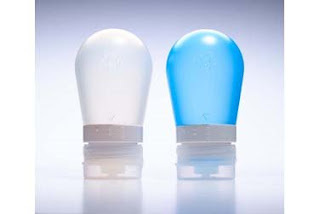 These fab bubble bottles are TSA size approved, have some fancy no-drip technology, and are SO fun to use. $21.50. 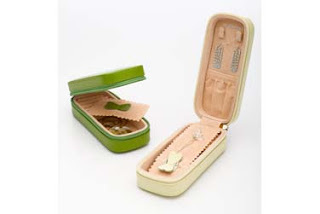 And this wonderful and adorable travel jewelry case is perfect for bringing pretties along, and comes in a variety of wonderful colors (I chose the parsley, which should come as no surprise).